Earlier an entity was considered as startup upto 5 years from the date of its incorporation. Accordingly, tax exemption under Section 80-IAC was allowed for any 3 consecutive years out of first 5 years of its incorporation as Start-up. Now, the Finance Act, 2017 has extended the period for claiming tax deduction so that startups can claim tax emption for three years out of first 7 years. 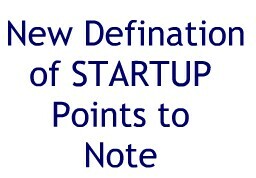 To align the provisions of the Income-Tax Act with the definition of startup the definition of latter one has been amended. Now entities would be considered as startups for first 7 years instead of 5 years. However, in case of Startups engaged in the biotechnology sector, this period will be increased to 10 years. It may be noted such Startups cannot claim tax exemption after 7 years of their registration. Earlier tax holiday would be available for eligible startups registered as Private Limited Companies, Partnership Firms or Limited Liability Partnerships (LLP's). Now Govt. has denied benefit of tax holidays to Partnership firms. Earlier entities were required to furnish many documents for registration as startup, like letter of funding by angel fund, recommendation letter, etc. The process of registration process as startup has been simplified. Now entities would be required to submit certification of incorporation and other docs as may be sought for registration as a startup.